Aggressive styling. Longer and wider wheelbase for more stability at high speed. Adjustable brakes and governor. All in one Design: On/Off Switch. Automatic CVT Transmission. Automatic oil injection, no premix needed. Battery: 7amp. Chain Tensioner. 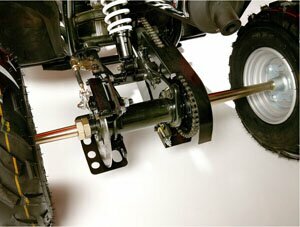 Dual Front & Single Rear Adjustable Shocks. Dust free ATV cover & Flag. Electric start with back-up kick starter. Engine stop switch for safety. Rear-Mechanical Disc Brake. Oil Tank low indicator light. Parking Brake. Simple field tool kit under the seat. This ATV comes with a free water proof/dust proof cover, 1 pair of shock covers, and flags. Size L x W x H 57" x 34" x 36"
Our Unison 50 ATV will provide your child with hours of fun, and the chance to explore their surroundings on 4 wheels. 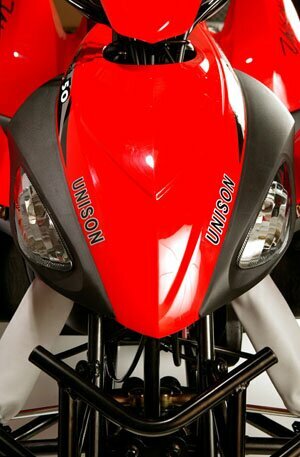 Additionally, Raceway ATV will match any advertised price on the Unison 50 ATV, just show us the competitors ad and consider the Unison 50 ATV yours! Our Unison 50 ATV is available in a number of colors to fit any child's particular interest, including Red, White, Blue and Black. 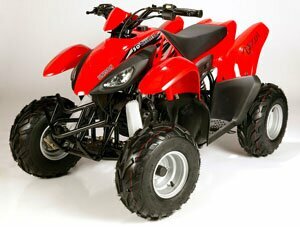 If your child wants a 50 ATV and you want a good looking 50 ATV, then the Unison 50 ATV from Raceway ATV is the one for you! 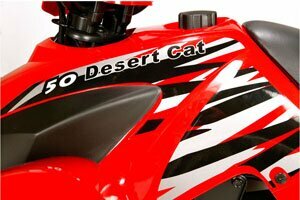 Call us today to get your Unison Desert Cat 50 ATV shipped to your door. 6 Month Warranty on the engine.